You don't get to have a metal blog, or even mention thrash metal at the most, without mentioning Slayer. So here's the only slightly overrated album that isn't half as played out as it's 80's older brothers. 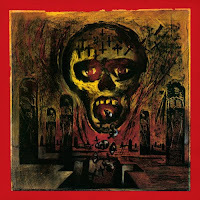 Seasons in the Abyss continues the American thrash metal sound that is notoriously recognizable as Slayer, and what's neat about this album is that they continue the lyrical content shift out of the "fantasy" themed lyrical content that the previous albums contained. Containing more visions of real life horror such as war or social criticisms; painting the then-current American era as a "cesspool of corruption and cruelty". 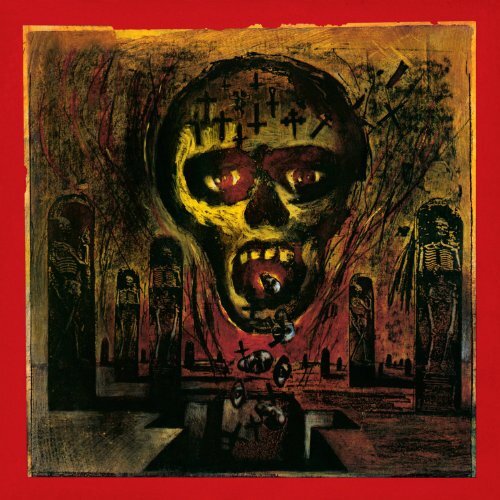 Slayer upholds all expectations with this album, reminiscing upon old Reign In Blood tones and speeds. "There were a lot of bands that had built careers by copying what we had done and we wanted to show everyone we could still do it better," King told Loudwire in 2016 interview about the 26 year anniversary of the albums release date. A true "THRASTERPIECE" of American metal. 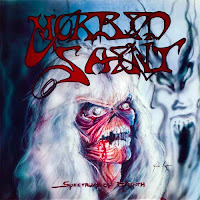 Morbid Saint was formed in the early '80s, but it tooked for a long while until their debut album came out. Which was their last record as well, There were countless of great one album extreme bands in the early '90s, who shortly disappeared after the golden age of these genres ended. Or like in their case, just played for fun and were more interested in personal life career. 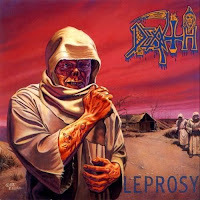 "Spectrum of Death" was an excellent very noisy, insane and aggressive thrash album, a bit close to the border of death metal. Even though they were less known, probably it was one of the heaviest and wildest albums of this style, and was also in the best hands at production too. The band didn't tried to follow any trends or rules, had no specific goals either, only showed some raw musical brutality. "Spectrum of Death" made their short active period very remarkable and became an important classic with Eddie's grandma on the cover. Morbid Saint surprisingly regroupped after a few decades and released a new album titled as "Destruction System". Exhorder appeared as a very heavy and wild thrash band in the mid '80s, but for sparking wider attention in the underground scene, they had to wait for a while. Their debut album had an unsual title and cover art as well, and with their aggressive hammering their name became well known soon. "Isn't this voice and vocal style familar from somewhere? Does it reminds maybe to Pantera?" This similarity marked that name too, and they couldn't get rid off being compared to them. Probably their music influenced Pantera's after it is known how much Phil Anselmo was fan of the main underground scene. The criticism wasn't polite either with the comparing. But it was always known that mainstream media never acknowledged underground music, and never was able to grow through their narrow borders. 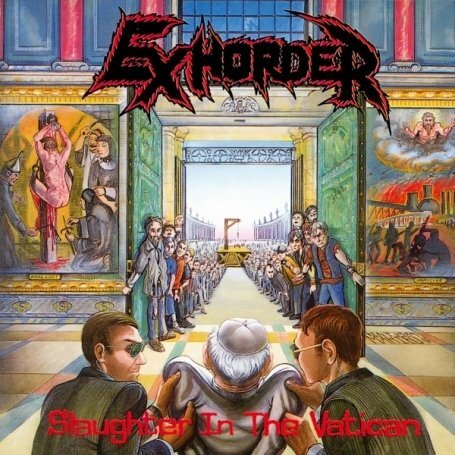 "Slaughter in the Vatican" shows forward from odrinary thrash metal to the lately more popular groove metal style. Since it's a very intensive album, the repetative, cathy bumping themes are also common. They were the pioneers of groove metal as well during their short active period. 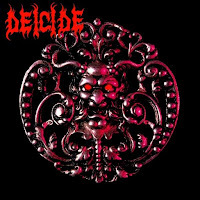 If people normally thinking about death metal and let's say that they know what is this style is about, Deicide would be one of the bands they would mention as a better known example. On the side of Cannibal Corpse, they are the best selling band of the genre. 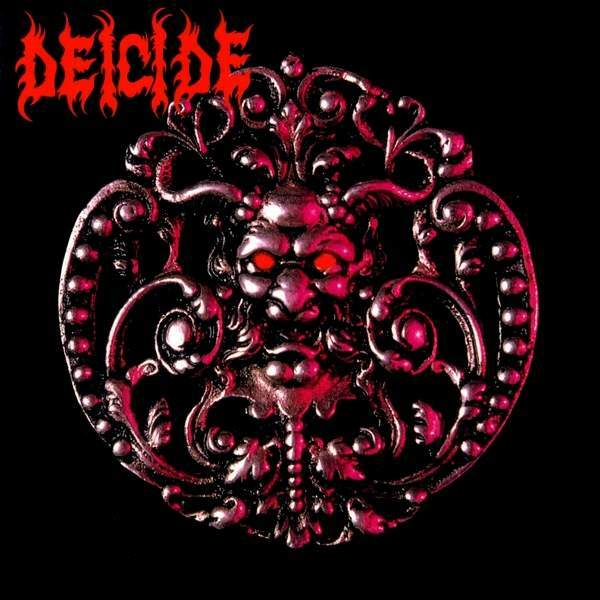 Deicide became so infamous mostly because of their exaggerated concept about satanism and anti-christianity. Their scandalous, blasphemous message was putting them into the focus of any sel-styled warrior wannabes of the proper faith in good Christian America, and later world-wide. And of course Glen Benton's attention seeking behavior was like oil on the fire. In truth their concept placed them into the center, not their music. 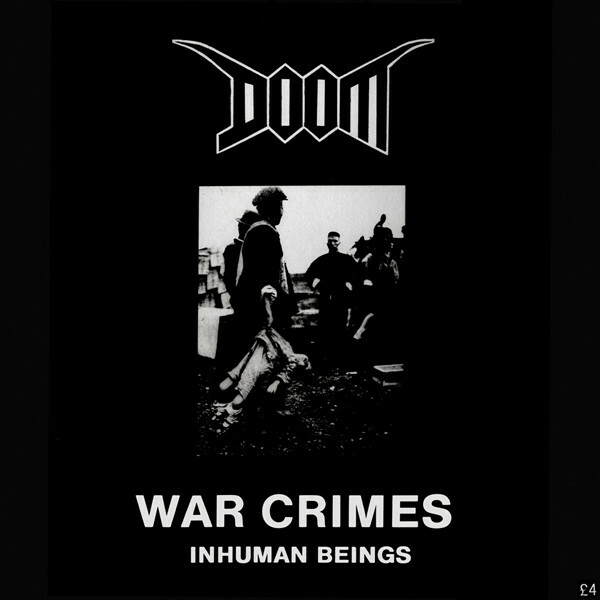 They've done their best to make this album so evil and aggressive as it's possible, to fit well in intensity to the endless hatred and rage they volunteered to represent. 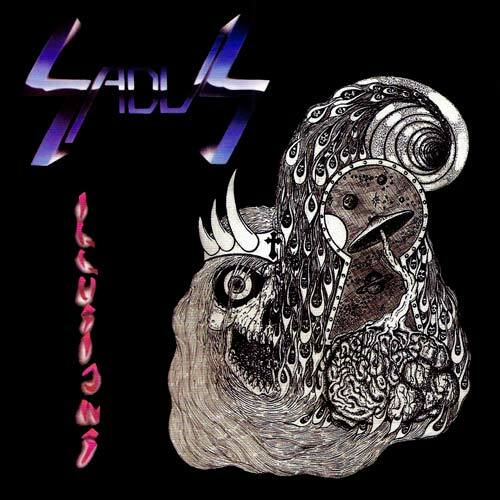 Wild, and cathcy themes are usual at this debut, it's probably their best record. Musically Deicide wasn't worthy for their central position, because even the Tampa Florida scene had plenty of better bands, so internationally it could be imagined too. For the rising of this band the limitless aggression of their music combined with their satanic concept was responsible, and of course the big loads of morons who tried to cross them and to ban their gigs and appearences. I think Morgoth's first 2 EP's together were one of the most brutal and highest quality old school death metal acts. There were dozens of brutal music in the early '90s, but such insanity with high quality together was really rare. 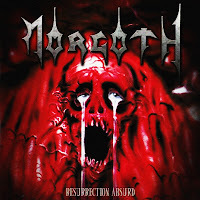 Morgoth's music was heavily influenced by Death, even in some of their themes on "Resurrection Absurd" some references could be found to "Leprosy" for instance. The intensity and aggressivity of that EP was really impressing, compared to that "Eternal Fall" may sound like a tiny step backwards, but includes more genuine themes, and have excellent Morrisound sounding. The lyrics, which are telling about the sickest and most gruesome aspects of human existence, are also could be taken as Death references. Alltogether both EP's are incomparable and genuine both in themes and vocal style. There was nothing that Marc Greewe's insane growling and screaming voice could be compared to. 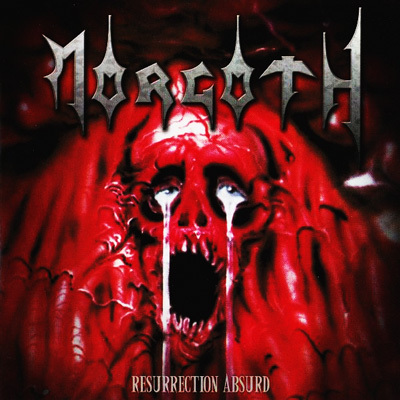 Morgoth was outstanding from the mass of the early '90s death metal scene, and "Ressurection Absurd/Eternal Fall" is maybe a less known, but very important timeless classic of the genre. The '80s European thrash scene was doubtlessly ruled by German bands, and on the side of Kreator and Destruction, Sodom was the part of that thrash trinity which had the strognest infulence to the genre. Their third full-lenght album, "Agent Orange" was a turning point for them in several ways. Musically they counted already as an experienced band with notable routine, the album had better sounding, and their themes became catchier. In lyrics they left behind the horror and occult topics, more serious lyrics were written instead about war and the hideous aspects of reality. 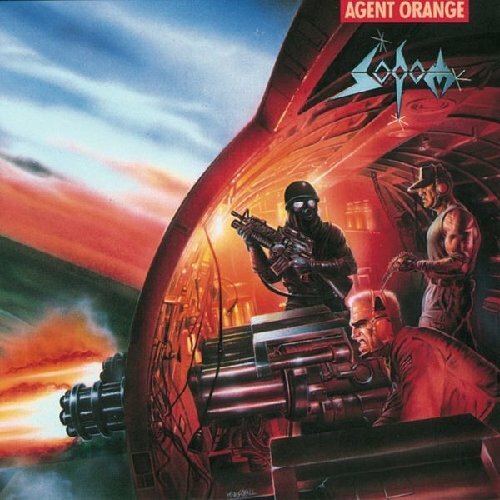 I also think that "Agent Orange" is their most rough sounding album. 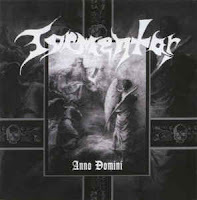 They always seemed like to balance on a borderline, being close musically to black metal in their very early period, lately close to death metal. 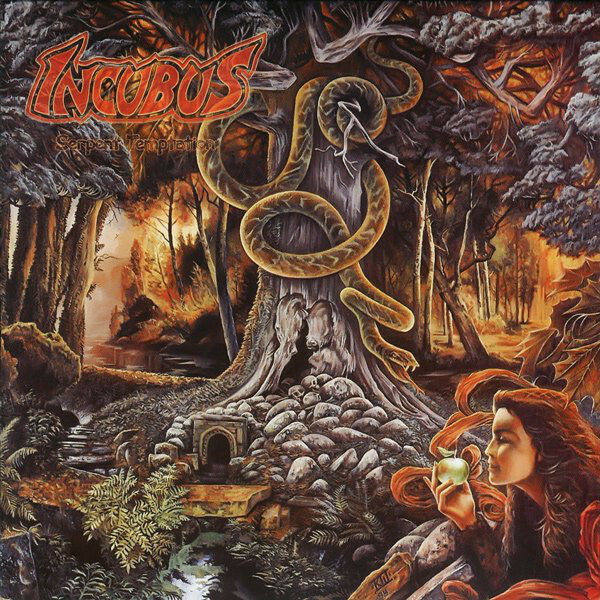 When this album came out, their name was well known, or better to say infamous already. This was their most successful period, they achieved all, that could have been achieved for an extreme metal band in the '80s. After Bathory, the next significant event in the developing of black metal leads us to Hungary. 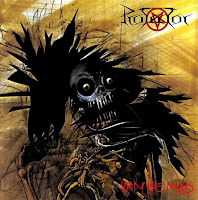 To find anything connected to metal music had very low chance that time through the iron curtain, but to find something modern, a pioneer band of a metal genre was really exceptional for sure. The members of the band were very determined to play something unusal and new, so being inspired by the northern black metal scene, which was still in embrionic form that time, they started to evolve their own style. "Anno Domini" used to be demo tape, but as we know, in extreme genres (and especially in this one) the lower quality is mostly not a disadvantage. So they used up the common lyrical topics, like occultism, grim stories of Transsylvania and of course legends of Elizabeth Bathory. "Anno Domini" was very thrash influenced, noisy, raw, insane and atmospheric, it was like their own independent way to approach black metal. 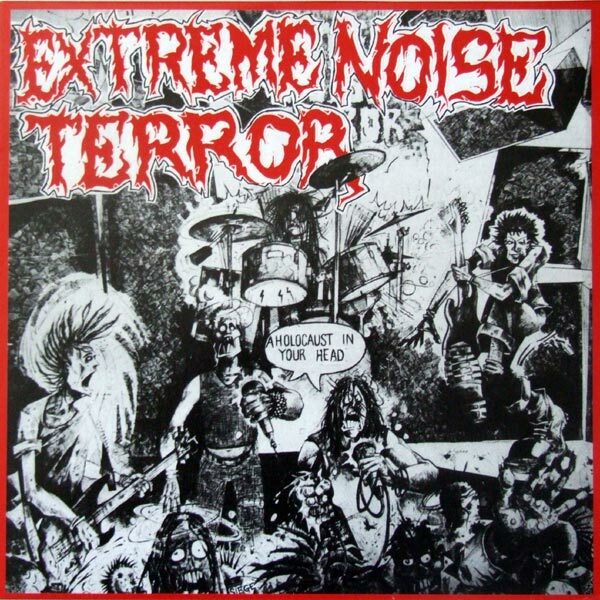 It became soon a cult and influental record between the fans of the northern extreme scene. Sadly the band had short active period, but their frontman, Attila Csihar was lately invited into Mayhem. 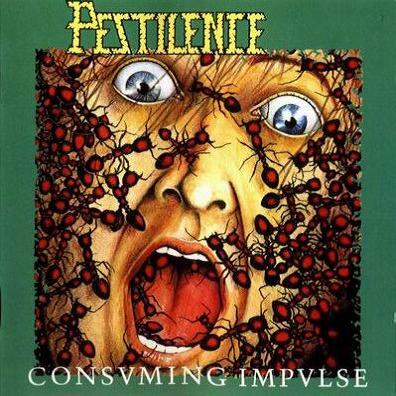 Pestilence had a remarkable influence on the European death metal scene. They were the first band in Europe who gained wide international success in this style. 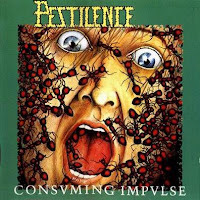 After the raw and very intense "Malleus Maleficarum", their second album, the "Consuming Impulse" gave them this success. Their music became mature, by cleaner themes, and much better, more aggressive sounding. Thanks to their contract with Roadrunner Records, they could record their albums in the US, so they were the first in excellent sounding quality as well on the continent. Their lyrics were much diverse, than at most bands. It was like a selection of various tormenting and destructive aspects of life. The suffocating vocals of Martin van Drunen describing them dramatically. The classical horror based topics were never usual at them. Musically they were diversive too, they always tryied to show something new, but probably "Consuming Impulse" was their most important album. An everlasting classic of the genre. War is a frequently returning topic in death metal. 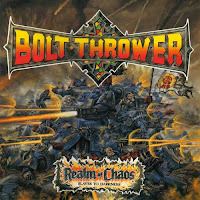 In the case of Bolt Thrower - which is one of the earliest British death metal bands - it's the only possible topic, and they seem like interested in any kind of war. And in the case of "Realm of Chaos" probably the fantasy/science fiction world of Warhammer 40K was the most inspiring. 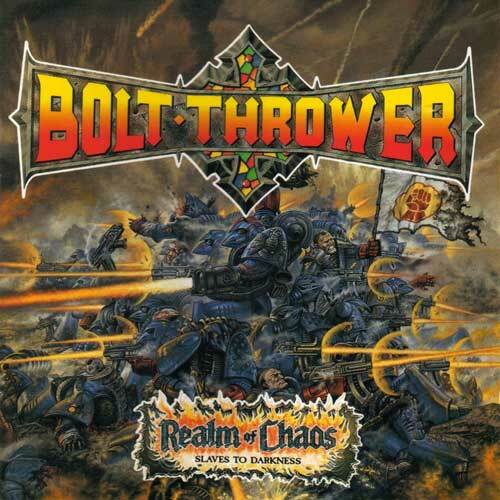 Bolt Thrower have a typical flat sounding which became their main feature, and it's also usual at other old school British death metal bands. 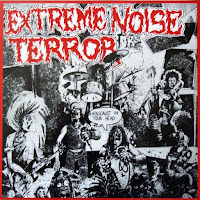 Even though it's extreme music, this sound could somehow turn powerless even the wildest hammering, and kills all passion from the listener for any possible destructive behaviour. Like some sort of passive aggression. Always a middle speed was usual at the band, but no matter how diversive or brutally good they played, they mainly just sounded like the same. 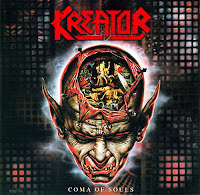 "Realm of Chaos" is one of those albums which may be an exception, where this incontrovertible law was weaker. The heavy, oppressive feeling they were into, prevails on "Realm of Chaos" the most. If horror fanatism is going by hand in hand with drug abuse, the outcomes could be often weird. Maybe even more weird than without horror fanatism. Before White Zombie was into industrial influences and became famous, they had a longer struggle on a rough way in underground. That period produced 2 full lenght albums, an the second, "Make Them Die Slowly" had a feeling that wasn't so catchy, but definitely attention sparking. It was more into heavy metal, but wasn't an ordinary style at all. Good and exciting themes appearing on this album very often, which were referring to heavy metal, but the ambitions to mix with a more alternative style, turned the whole music into a weird way. Sometimes it's very dark, but suddenly turns groovy, sometimes they sound miserable, and later more like chilling, than more intensive again. It could portray maybe the side effects and exaggerated mood changes of a self-destructive lifestyle. Whatever the inspiration was, it's an interesting album. The extreme genres and their scenes just barely started to develop, but others were looking already for some even more brutal musical approach. Grindcore was formed by mixing HC punk and thrash, so that means short and very simple, more melodic basic themes which are ending up in the most insane grinding as it's possible. 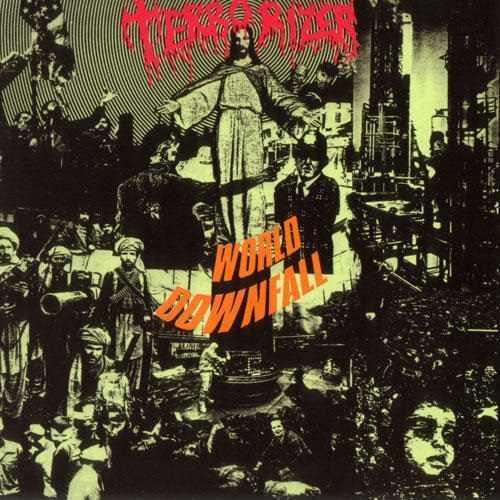 Terrorizer used to be a short existing side project or power group of some members from Morbid Angel and Napalm Death. With this line-up they recorded "World Downfall", which became one of the very classics of grindcore. By involving death metal influences too, this style replaced the usual HC punk influence, and made the music more rough than old school grindcore is in general. So the catchy melodic parts are missing, no chance for calm down, there is wild thrashing instead. The songs are more complex and brutal, but the usual political and societal topics remained as a main characteristic. 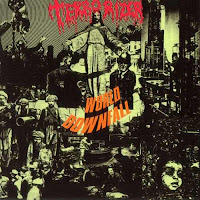 "World Downfal" had an important influence on the grindcore genre. 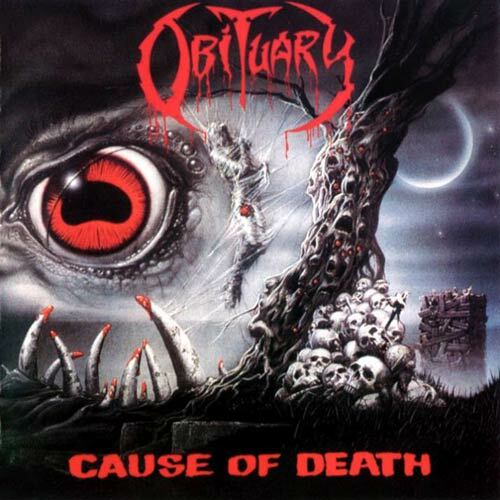 The best thing about the old school Floridan death metal scene was that every band had it's own genuine style, and it wasn't hard to distinguish them. Morbid Angel was one of the earlies and most successful bands of this notorious scene. 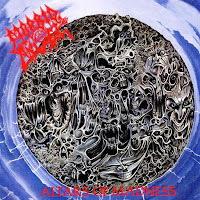 "Altars of Madness" was the result of long progress of experimenting with thrash metal from the early '80s, and therefore the band appeared as the musically most developed death metal band. Their music was way more complex compared to the other classics of the genre, and showed wider diversity. To debut with a musically so mature album is kind of rare in all new found styles, so Morbid Angel was ahead of it's time. 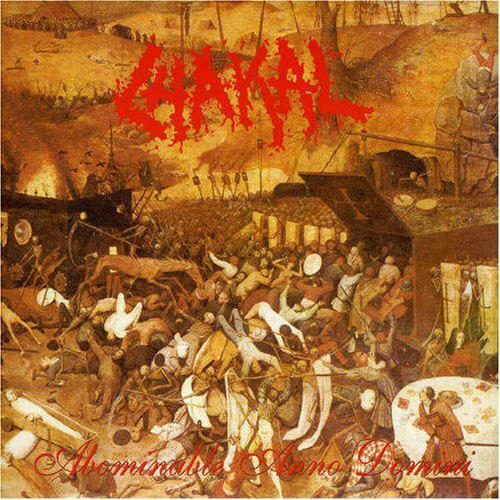 Similar complexity in death metal was usual only from the mid '90s. 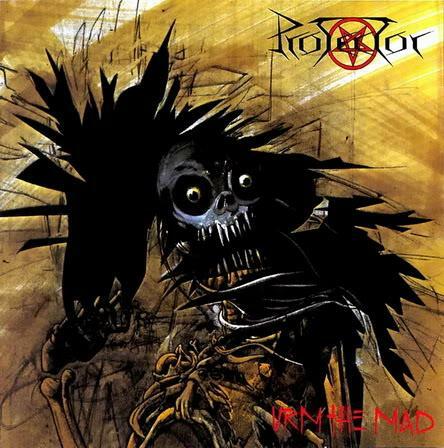 The album was quite intense and included plenty of thrash metal influences, but also opened a way further. While the guitar themes reminded to the wildest thrash bands of the '80s, the drumming style of Pete Sandoval was sometimes like a pre-introduction into the meanwhile developed grindcore style. And such as all other Floridan death bands they also gained wider attention by shocking the audience with their blasphemous and satanic lyrical concept. 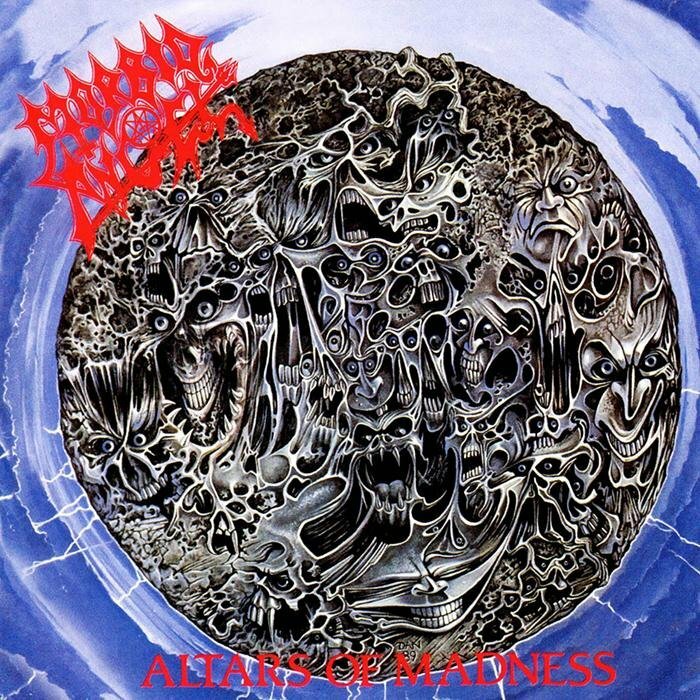 No wonder that "Altars of Madness" became one of the most remarkable death metal classics. Not the UK was the only birthplace of grindcore, even though the genre was the most productive in that area and became known worldwide. 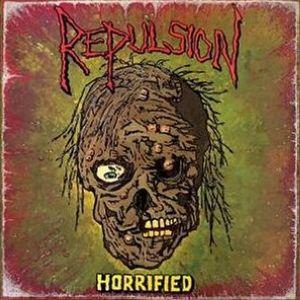 The music (or noise) that Repulsion played counted as a milestone in extreme metal. 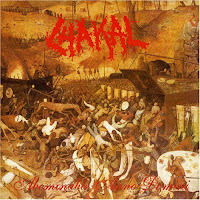 The band created the basics of grindcore in the '80s already, parallelly with bands like Carcass, Napalm Death and Terrorizer, but their name became less known probably because of their lower productiveness, short active period and common name changes. Even the current material, their one and only full-lenght record that was basicly a demo tape, came out under the name Genocide first titled as "The Stench of Burning Death". Later as Repulsion - "Slaughter of The Innocent". But thanks to Necrosis Records founded by Carcass members (Mr. Jeff Walker and Mr. Bill Steer) the record wasn't completely lost and forgotten, but had a release under the name of Horrified. While most grindcore bands were into political and societal topics, a few others (like Carcass) were more interested in gore. Repulsion also could be sorted to the second group, and they were inspirational for late goregrind bands, but their lyrics showed more similarities to ordinary death metal lyrics. The early elements of the genre such as punk, death and thrash metal could be sensed well from their primitive themes, and introduced a new level of musical extremeity by their intesiveness. 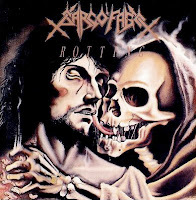 After Sepultura, probably Sarcófago had the strongest influence on the South American metal scene. But while Sepultura played later more acceptable music for the ears of the generic metal fans and became famous, Sarcófago kept it's exaggerated style and stayed underground. They always tried to show something new on their albums, a different aspect of extremity, by balancing on the border of thrash, black and death metal. The rate of these features was mostly changing, as it's possible to say that now about a past time period, when the differences between these styles were not really distinguished yet. Their music had maybe the darkest possible tone with the maximum level of insanity on the "Rotting" EP. "I.N.R.I." was already a big hit in their quest to create the most aggressive music ever, but they probably reached their goal by "Rotting". The intensiveness of this record was remarkable and formed the coldest and most cruel musical atmosphere, where it's folly to look for catchy melodies to guide. Chaos and insanity awaits here to cast down the listener into the darkest depths. 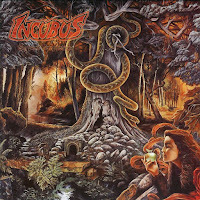 On the side of Death, Incubus was the second band which caused sensation with their impetously aggressive music in the late '80s. Unlike other similar bands that time, they didn't concentrate only to perform the rawest brutality with their music, but also cared a lot about the quality. During their short active period, which produced only 2 full-lenght albums, they piled up so a lot of awesome and catchy themes, which would be enough for twice more albums in this style. Their music was more complex than what other thrash or early death metal bands played, and this way they were one of the first ones who involved technical themes into extreme music. There is not a boring moment to find on this album, everything's well composed, and the wild thrashing parts are like only serving a short break to get ready some exciting or unexpected change. The quality of their music was ahead of their time, bands with similarly complex ambitions were spreading later and not only in extreme undergound, but on the main metal scene too. Death SS is probably one of the oldest and most underrated metal bands from those who were inspired mostly by the horror genre and occultism. Their main influences were probably Black Sabbath and Alice Cooper because of their theatrical stage performances and appearence. They are active since the late '70s, so they could be an interesting example to see the development from hard rock to '80s heavy/speed metal. Of course it wasn't a plan. Stefano Silvestri only wanted to express the classical horror feeling of old comics and movies by their music, which is dedicated on this album to the most common classic characters of the genre. Similar to Exorcist, Death SS is filling a missing temporary period in metal music, and sadly they are similarly less known too because of their label's bad distribution. So they couldn't had huge influence on the main genre outside the borders of Italy, but their music could always cause exciting moments for the fans of horror based heavy metal. As the main scene started to get wilder, punk music had to change too, and also developed it's extreme form by the style of crust punk. Doom was one of the earliest and most influental crust punk bands. 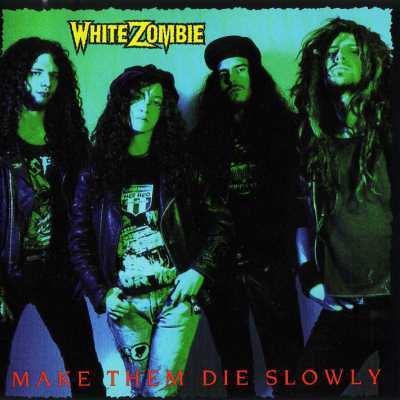 Their music sounded way harsher compared to ordinary punk, and became similar to thrash metal. Since thrash is a punk influenced genre, this step didn't count like something extraordinary, but extented punk music into an exaggerated direction. The basic themes and drumming style stayed, but the sound became quite distorted and the themes less melodic. Diversity is definitely not the common feature of crust punk, all songs are like the same aggressive and intense, and the whole album is just an overwhelming thrashing rampage. The vocal style was more aggressive, almost growling-like compared to the basic punk shouting/fake singing vocals. 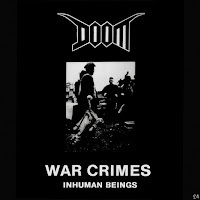 Political and societal lyrics kept their main importance, and Doom tried to focus on heavier topics, to paint a very dark picture of the most animalistic aspect of life and humanity. That may be too much for ordinary punk as a constant theme and gave a more serious background for the genre. Along the Tampa Florida scene, but independly from them, others tried to merge into deeper extremities as well. And this independence or isolation resulted a different way of expression. 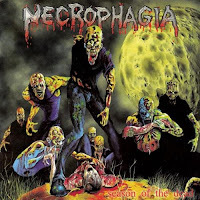 Necrophaghia was also one of the first death metal bands, and probably the most horror addicted one too. 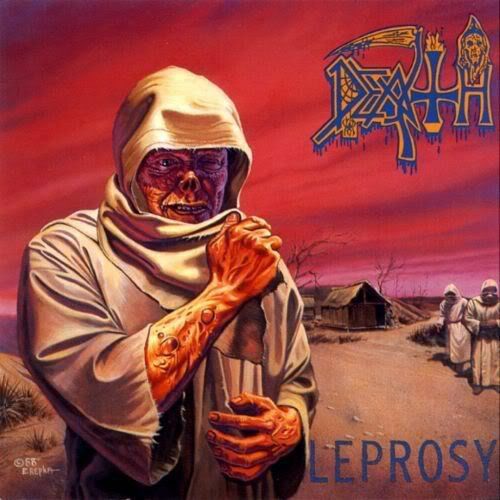 "Season of the Dead" is not only interesting because of this, or because it was the first full-lenght album on the side of Death's "Scream Bloody Gore", but this album is also a proof, that it's possible to do death metal vocals even if someone can't growl. 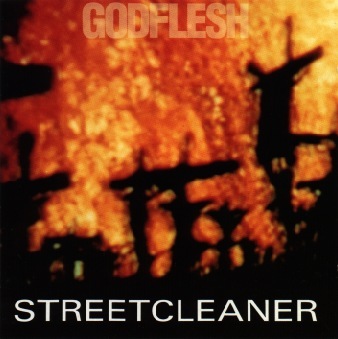 The vocals sounding more like excited narratives which are sometimes ending up in moans by the pleasure that a gore fan could feel after the visuals of the bloodiest scenes. Killjoy's horror overdose added an ominous feeling by the calmer and melodic parts to the album, which are referring to the feeling of old horror movies. The music is more characteristic to express the "fun part", trying to convert the disturbing visuals into the language of music. The only difference is that the duration of suffering and the main plot line is reversed here. There are plenty of references to the classics of the horror movie genre. That gave the spirit of this band.